There are 4 body styles in Williamsburg Garment Company men’s jeans. Each fit is named after a street in Williamsburg Brooklyn. Below, from left to right are the smallest (South 4th Street) to the largest (South 2nd Street) fits. Leg opening spec is based on size 30 jeans. Measurements increase or decrease with jeans size. S. 4th Street is a SKINNY JEAN but the fit is not skin tight. It's the slimmest fit with a slightly lower rise, smaller seat and thigh than the next jeans fit up (Hope St) with a 13” leg opening. 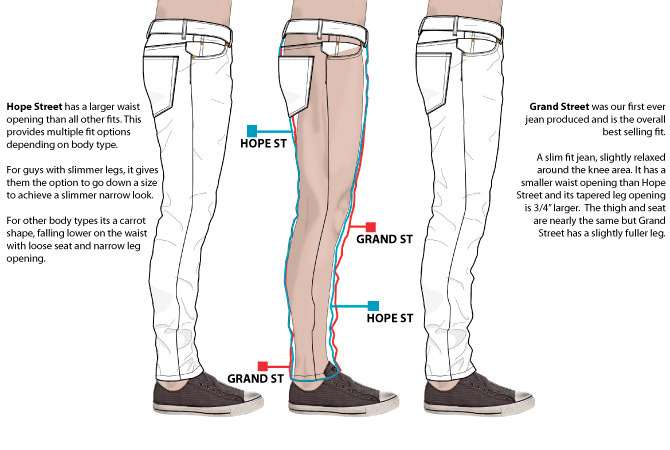 Hope Street was our first American made jean. It is our slimmest SLIM FIT JEAN and the waist is slightly larger than our other styles. This allows guys with slimmer legs to go a size down for a really slim fit. The seat, rise and thigh fit like the Grand Street, but the legs are smaller just above the knee down to its 13” leg opening. Grand Street is our #1 selling fit. Slim with just a bit of ease around the lower thigh and knee areas. Nearly equal in rise & thigh to Hope St with 13 3/4” leg opening. S. 2nd Street is our basic relaxed fit. A straight leg jeans with just a bit more ease in the thigh than Grand St, falling nearly straight down from the knee with 16” leg opening. Hope Street has a larger waist opening than all other fits. This provides multiple fit options depending on body type. For guys with slimmer legs, it gives them the option to go down a size to achieve a slimmer narrow look. For other body types its a carrot shape, falling lower on the waist with loose seat and narrow leg opening. 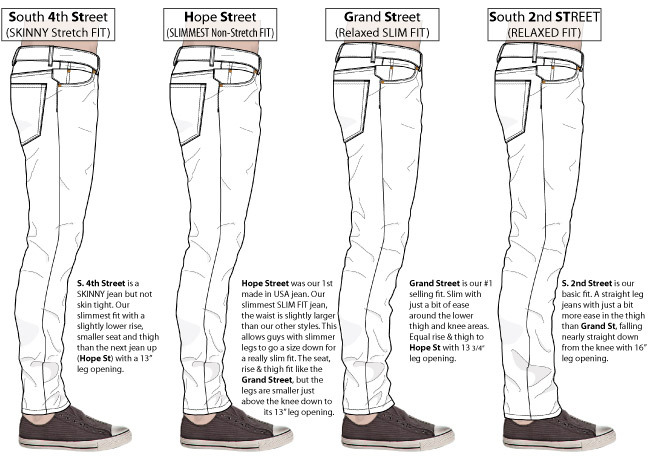 Grand Street was our first ever jean produced and is the overall best selling fit. A slim fit jean, slightly relaxed around the knee area. It has a smaller waist opening than Hope Street and its tapered leg opening is 3/4” larger. The thigh and seat are nearly the same but Grand Street has a slightly fuller leg.